"I'm hiking the Appalachian Trail"
South Carolina Gov. 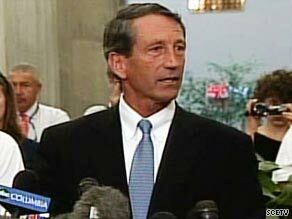 Mark Sanford chokes up on Wednesday as he admits to having an affair. I am so proud of my friend Mark Sanford. OK, to be fair, we've never met. But after using "hiking the Appalachian Trail" as an excuse for some very different endeavor, I feel he's a something of kindred spirit - at least in his creative use of excuses. No, I have no plans to fool around on my wife. First, she's a hottie (and I love her dearly). And second, I'm not a Republican, so I'm not uptight and repressed. I'm also not a Democrat, so I have a spine. But I am a writer and we writers are always looking for good excuses. Oh, my article's late. Sorry, I was "hiking the Appalachian Trail". Oh, forgot to take the trash out. Couldn't. I was "hiking Appalachian Trail". I didn't sneak out to buy a box of Krispy Kremes. Oh, no. I was "hiking the Appalachian Trail". Didn't get my (fill in the blank here) in on time. Well, you know, I was "hiking Appalachian Trail". The story of Mark Sanford's meteoric rise to Great American Jackass has the makings of a movie of the week. There's vast sums of money, greedy political maneuvering, a disappearing politician, and, unusual for a Republican, a woman. At least it wasn't some quality man-on-man humpadump from yet another "I'm not gay" leading light of the Republican party. I understand life's been tough on Mark these last few weeks. After all, turning down all that federal money for his state's unemployed took a lot out of him. That's why, exhausted from his fight, he, uh, vanished. And, apparently, he vanished without telling his wife or even key state officials where he was going. Governors have some pretty serious positional responsibilities and simply shirking them for a series of long distance quickies calls in further question about Sanford's ability to lead. Let me be clear: this isn't about the fact that yet another dude has hung his chad. This is about a man with important responsibilities to a struggling citizenry, a man who's been extremely political in recent months, who seemed to have lost something of his grasp on what constitutes acceptable behavior. If there's one thing about politicians I'm thankful of, it's their entertainment value. My wife, a nursing student, thought he might be in a dissociative fugue. A friend thought he might have been kidnapped. My bet was on hanky-panky and, cha-ching(!) I won that one. Apparently, while his staff insisted he was - wait for it - hiking the Appalachian Trail, he was, instead, doing something (or someone) more "exotic" in Argentina. I'm sure those citizens of his state, running out of unemployment and wondering how they're going to do something exotic, like pay their bills or buy groceries, were thrilled that Mark went to Argentina to get his, um, votes counted. If, years from now, we remember my buddy Mark for anything, it'll be for adding "hiking the Appalachian Trail" to the lexicon. As to infidelity in marriage, it is not so unusual. The outcome of the indiscretion, depends on how the wife or husband reacts to it. We doexpect our elected government officials to concentrate on their duties and show better judgement and better morals at least while in office. No one is perfect, without fault even the sanctimonious republicans, period. This post nailed it; one of the best I've seen. After all, adultery is old hat by now, neither the purview of Repubs or Dems. It's all the surrounding stories that blow this up-the Trail, the disappearance, the choice of a foreigh-born woman (southerners not good enough? SC women are insulted in several different ways). If it weren't for the wife and kids, it would be unbelievably hilarious. As it is, it further demonstrates the infallibility these guys develop. Sometimes God allow things to happen for a reason. Be careful of the words you say and learn not to do things just because of negativity for sheer light for the opposite party because.. we will surely find ourselves lit up from the darkness. Governor, you seemily graceously came out today and tried to speak the truth about the 'other relationship' but if it was a statement meant to reconcil with public interest or morals meant for your family and not really meaning it, then you owe your honesty to your wife and sons by not worrying what others say. Remember the citizens from SC needed their unemployment. Now perhaps you will allow something more to happen and have others talk about it in a positive way and learn from the mistakes that we all make at times, by helping others to help themselves with confident and allowing the citizensof SC to have their unemployment that you did not accept. Governor think about their families! My grandmother would always.... say "what's done in the dark, shall come to the light'. You see Governor.....things happen for a reason! B. No prosecution for adultery shall be commenced except upon complaint of the husband or wife. Sanford can be replaced. I care about Lisa Ling's sister and fellow journalist in North Korea. Some things are just more important to be concerned about. Yeah..when I heard he was missing for 5 days...I said ummm another woman maybe? so much for Christianity. The problem with the Republicans is simply hypocrisy. They proclaim "family values" and stand in judgement of people who are doing the very same thing they do! If they stopped catering to the uptight religious right, and took care of politics – which is what they are paid to do – and not personal morality, they might have more adherents. The way they're going, their "base" is way too small – besides being out of touch with current realities. I believe all this means the governor is an advocate of off-shore drilling. Carol is right – this post and especially some of the comments it has gotten are not in good taste at all and I'm surprised to find them on this blog. Sharon: How about Clinton, Edwards and Spitser? I don't think it really matters, if you are a Dem, or a Republican. If you break your vows, you break your vows. And, I believe there are alot more of there, the only difference is they haven't been caught,or they are really better liars, then the ones who did get caught. Apart from his evident deriliction of duty, how exactly did he pay for this trip to Argentina...not just the plane but the state cars etc. I smell criminal behavior here not just human weakness. I think he meant "hiking the Argentina tail to clear his ........head". Considering his lack of respect and stature "Pike's Peak" is most likely an over estimate of his abilities. If he can do this for a roll in the sack can he really be trusted to run SC? Iranian woman live and accept polygamy, american men denounce the responsibility,and prefer a lifelong mistress,...? Does anybody know the true definition of "is",is? Ooooooh! I thought "hiking the Appalachian trail," was a euphamism for... well, you know... intimate relations. That makes me wonder if she said she was "scaling Pike's Peak?" OK Can the GOP get off the high & mighty conservative morality crap? Stop throwing stones at glass houses and using your religion's morals to cover for your indiscretions. Keep shooting holes in your conservative morality. Thanks Governor! Gingrich. Enson. Sanford. Even the conservative Bible says: "Let the guiltless among us cast the first stone." Isn't it about time for the GOP to step back from its holier-than-now mound and realize that its pitching staff is dwindling by the day? I love how these conservative politicians rant and rave about "protecting marriage" from the "gays" but can't seems to find it neccessary when it comes to there own lives. Last week it happened, and again today. What a bunch of hypocrits. I was right about this from the post yesterday and that it was him! My theory for life...live it as if it will be on the cover of a magazine or breaking news and then ask yourself if you like the tag line! If not, don't do it for time will reveal all. Nicely written David, a fair appraisal of a pathetic politician! Cover up story of something much deeper! I absolutely love the application of "Great American Jackass" to one Mark Sanford. The American people have been forced to stomach a W; a Spitzer; a McGreevey; a Pelosi; a Frank; a Todd; a Richardson; a Mozilo; a Greenspan; a Madoff; a Cayne; a Thain; an O'Neil; and now a Sanford. I'm sure there are countless others, however, there are more than enough examples for a coffee table book entitled "Great American Jackasses." Absolutely hilarious. Well done, Sir! Sorry but I don't find this post humorous at all. In fact, it's offensive and I'm surprised that it is on this blog. You don't cheat on your wife because "she's a hottie". So if someone's wife is a plain-jane, it's ok? I guess Sanford's wife didn't look too good – so it's fine. Then, "..... some quality man on man humpadump"?? Interesting phrase – especially for this blog. Yeah, maybe you should take a hike. With the recent revelations from Gov Sanford and Senator Ensign, who needs gays to destroy the sanctity of marriage in the US...we have the GOP! reminds me from "The Official Rules" subsection "how to differentiate Republicans and Democrats"
Republicans close their blinds at night. Those quips were written back in the 1970s I think. I rather doubt it was true even then. What the count for (known) affairs – Democrats versus Republicans? Based upon Office Held (President/VP, US Senator/Congressman, Governor, State Legislator)?